This was sort of explained in the previous tutorial about the use of stacks within Aperture. Stacks are very important as they control the way you work with photos in the Aperture program. For example every time you modify a photo a new image is made. If there was no way to organise these photos you would have hundreds of the same photo except with minor alterations with each one. There would be to many photos, it would become to cluttered and you would find it hard to work. The use of a stack reduces the amount of photos that are in the file browser. They are still there only hidden. This reduces the amount on screen improving work flow. As well as individual photos you can put similar (or not very similar) files into stack of there own. This can be used for files that you don't like or for shots that you took in rapid succession and do not need to be separated. Of course you can break up stacks and have stacks within stacks. Although stacks within stacks are broken up. If you are ready I will give you a guided tour of the features and interfaces that you see and use to be able to use stacks within Aperture. Click any of the image for there full versions. If you are new and haven't yet got your copy of the program. Visit the Apple Store for more information. OK, the main menu for stacks which I would be referring to through out this tutorial is on the menu bar. Clicking on this menu will get you all the different menu options of the stacks. I will be referring to options from within here. So if you can't find what i'm talking about here is a good place to look. If you notice the following image is in a stack. It was used in the last tutorial. Stacks are defined by the number badge in the top left hand corner. This number increase as more images are added to the stack. The stacks menu. Located in the menu bar at the top of the screen this offers all of the option or creating and modifying stacks. There are shortcuts so you can use them to quickly achieve what you want. If you open a stack, all the images are displayed. They are encompassed by a small blackish boarder, so you can still figure out that they are still in a stack. The number in the top left is still present. The top half of the Stacks menu is about creating and breaking stacks, if you look at the photo below you will see what I mean.. By selecting photos and using the Stack option, these photos are then placed into a stack. The unstack option removes the photos from the stack. It doesn't open and close stack as I originally thought when I first used this program. It may take a while to realize what this does. Split stack is a bit like taking a knife to the stack. If you click on a, say the third photo like in the photo above the first and second become a separate stack and so do the third and last. Extract removes the single (or more than one if selected) out from the stack. 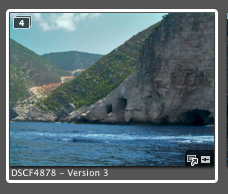 A quick tip, if you drag and drop a photo into the stack it is the same as adding. Dragging the photo out also works. A small green vertical arrow will appear if the photo is out of the stack. Moving down there is the auto stack option. This I find is a bit hit and miss. It automatically sets its own stacks depending on the photos you use. and the parameters you set. When in stacks the image you create may be more important that the one that is currently shown at the front of the stack. Using the pick button promotes the image to the top. This is the main image shown when you close a stack. The album pick is similar but for albums. Promote and Demote move images up and down a stack. For example if you have made lots of modifications to an image and have lots of photos in a stack you can use the promote demote options to move and image up and down. A rank of you image if you will. If you promote and image all the way to number one it is the same as pressing pick. This next screen shot of the menu are the navigation options. Previous and Next stack do pretty much what they say on the tin. This one is slightly different in that it selects the stack that you move to. The previous option just moves the image browser view to the stack thumbnail location. This option is what you should use for opening and closing stacks. This a bit like a book or a draw opens the stack out so you can see all of the images. The option at the top of Close Stack changes between close and open depending on what stack you have chosen an weather it is open or not. Finally as an end note you can quickly customize the tool bar at the top with the stack options. Right click on the menu and select Customize Toolbar. 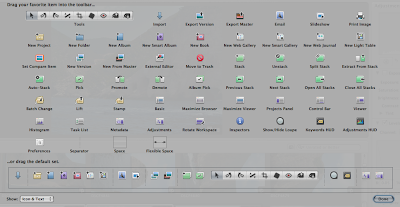 You are then presented with all these options to add to the toolbar. Which like any option with in Mac OS X Tiger you can drag and drop the options as you want. 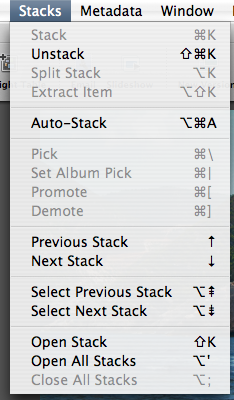 On closer inspection these (the icons in green) refer to the options you what for stacks. All the other options I will go over in due course. Hopefully this has give you an insight into stacks and how to use them. If you want to see the rest of the tutorial please use the Aperture label.